[PDF] Multivariate Statistical Methods: A Primer, Third Edition | Free eBooks Download - EBOOKEE! Description: Multivariate methods are now widely used in the quantitative sciences as well as in statistics because of the ready availability of computer packages for performing the calculations. While access to suitable computer software is essential to using multivariate methods, using the software still requires a working knowledge of these methods and how they can be used. 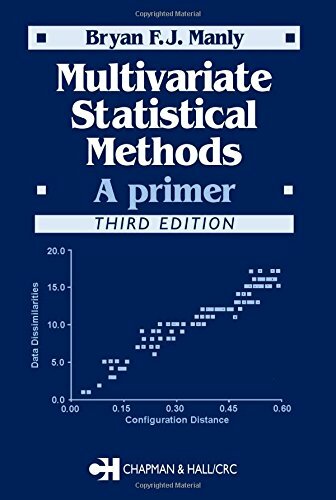 Multivariate Statistical Methods: A Primer, Third Edition introduces these methods and provides a general overview of the techniques without overwhelming you with comprehensive details. This thoroughly revised, updated edition of a best-selling introductory text retains the author's trademark clear, concise style but includes a range of new material, new exercises, and supporting materials on the Web. New in the Third Edition: Fully updated references Additional examples and exercises from the social and environmental sciences A comparison of the various statistical software packages, including Stata, Statistica, SAS Minitab, and Genstat, particularly in terms of their ease of use by beginners In his efforts to produce a book that is as short as possible and that enables you to begin to use multivariate methods in an intelligent manner, the author has produced a succinct and handy reference. With updated information on multivariate analyses, new examples using the latest software, and updated references, this book provides a timely introduction to useful tools for statistical analysis. No comments for "[PDF] Multivariate Statistical Methods: A Primer, Third Edition".